Thin tubes of glass jut up like bamboo and twist around each other; they’re peppered with colors that could easily make their home in Willy Wonka’s chocolate factory. They’re like candy canes for the eyes. You might have been one of many Riverwesters fortunate enough to walk by the corner storefront studio at night and see one of Al Blankschien’s neon glass sculptures breathing beautiful colors of light out into the darkness. From northern Wisconsin, to Chicago, to Milwaukee, Al Blankschien found his way to Riverwest, where for the past 26 years, he has made it his home. Blankschien was born and raised in Clintonville, about 35 miles west of Green Bay where his family had some farm acreage. “I was kind of a half country boy, half city boy,” said Blankschien. “We were close to downtown, close to the country, but had the advantages of both.” From the tranquility of small-town Wisconsin, Blankschien made his way to Chicago where he pursued his education at the School of Art Institute of Chicago. He took most of his academic courses at Concordia College in River Forest, a western suburb of Chicago. Concordia College, according to Blankschien, was a 55-minute L ride, each way, from the Art Institute. He chuckles at the remembrance of this lengthy commute, which he says wasn’t all bad, “It gave me a chance to read and look at girls,” he remembered. Blankschien has fond memories of his days at the School of Art Institute of Chicago. “I really loved the Art Institute,” he said. “Talk about an old, typical art school with an open courtyard for sculpture. I liked that place.” After wrapping up a Bachelor of Science degree in education, Blankschien taught art for four years at Milwaukee Lutheran High School. The only art teacher on staff, he taught five classes and enjoyed it. “Education,” said Blankschien, “if it’s not the most important occupation, it’s one of them.” It was with a self-critical eye, however, that Blankschien felt he could do a better job teaching art, so he enrolled at UW-Milwaukee, eventually acquiring a Master of Science degree in art education. “Along the way, I got interested in sculpture,” he said. So after his graduate work, he decided to give himself two years to make it as an artist. “I’m still in that two years,” Blankschien said with a laugh. 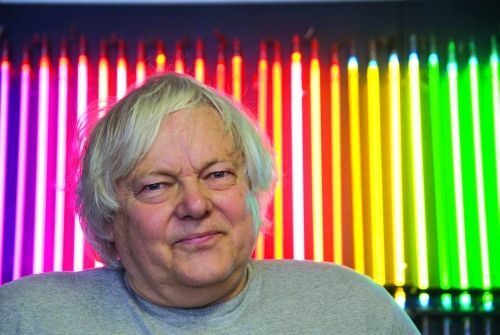 “I’m still not making a living at it, but we’re stumbling along.” Blankschien’s work with neon came about after one of his sculpture classes, where one of his UWM professors had the students work with electronics. Some of his classmates did some work with neon, and Blankschien thought it was neat, so he made some designs and gave it a try. “Eventually, this one guy was getting ready to retire,” said Blankschien, “and he said, ‘Hey, if you buy my equipment, I’ll show you how to use it,’ and that’s what I did.” Now it’s thirty-five-plus years later, and he’s been doing neon ever since. Along with Blankschien’s more artistic pieces, he also does commercial neon work for business owners. Trek over to Artists and Display Supply Incorporated on 90th and Burleigh, and you’ll find some of his efforts. He also did some neon for the original Suburpia sandwich shop, as well as Major Goolsby’s. Nowadays, Blankschien doesn’t do as much commercial work as he used to, but he still does occasional repairs for his old customers. As far as his neon art is concerned, Blankschien doesn’t buy into the philosophy that says every piece of art you produce has to have some deep, mystical meaning. “The art world is run by art history majors,” he said, “and they think that you have to be consciously thinking of your message to the world all the time. But artists do it because they love making stuff. I just do it because I like it. I enjoy working with my hands.” It’s one thing to dream of supporting yourself through your art, but a family changes things. Blankschien is glad to have the help of his wife, Judy. She is a nurse for the city of Milwaukee, where she works in post-natal care. They have three children: Johann, 22; Anna, 20; and Breta, 17. According to Blankschien, Riverwest has been ideal for raising a family. “The neighbors are great,” he said. “The combination of the old standbys and the new college students and professors and whatever; it’s a good mix.” Plus the proximity to things cannot be beat. There’s access to the freeway, all kinds of shopping, grocery stores, entertainment, and Escuela Fratney School, where Blankschien’s children attended. “It has everything I need,” he said. Furthermore, “Riverwest has a lot of kids. Our children had their choice of friends growing up.” So for those who are thinking of making a career in the art field, Blankschien offers this parting thought. “The fine arts are a tough way to make a living. There are so many people going into art, and how many can the economy support?